How do I find out my H-index? We should not be determined by numbers. Sometimes we work long and hard on a project that is important and the analysis is thorough, but the paper resulting from that project does not get its proper recognition. Sometimes, by sheer luck, we stumble on something that gets lots of views. Such is the plight of the scientist today. Nevertheless, one metric that “attempts to measure the productivity and impact of the published work of a scientist” is the h-index (Wikipedia). The definition: “A scientist has index h if h of his/her Np papers have at least h citations each, and the other (Np – h) papers have no more than h citations each.” So in decreasing order of citations, where your your nth paper meets your nth citation. Of course, the highest number your h-index can be is actually the number of papers you publish. Criticisms include skews to large collaboration projects and self-citation manipulation. In quasar science, the birth of an AGN is a hotly studied topic. That is because of two reasons. For one it takes a violent or turbulent event for the particles in a galaxy to move to its center and make the black hole there active. Think of it this way, it would need something quite radical for the earth to move away from its current orbit and suddenly fall into the sun, even though it has about 99.8% of the Solar System’s mass. Angular momentum conservation is just too hard to break. The other reason AGN triggering is important is that we think that the active galaxy has a big impact on the rest of the galaxy. We see this by the close correlations between the black hole mass and the host galaxy properties However, by the time we observe the galaxies this close relationship is already established, so studying the birth of AGN might bring us clues to the mechanisms that establish this relationship. The picture became much more muddled in the 2000s, though. The theorists could explain the formation of elliptical galaxies, their bulges, the close relationship between the black hole mass and the host’s properties, the triggering of the AGN and many more phenomena with ever improving simulations (see Phil Hopkins’ great summary in the picture above). However, the observational picture showed various results. 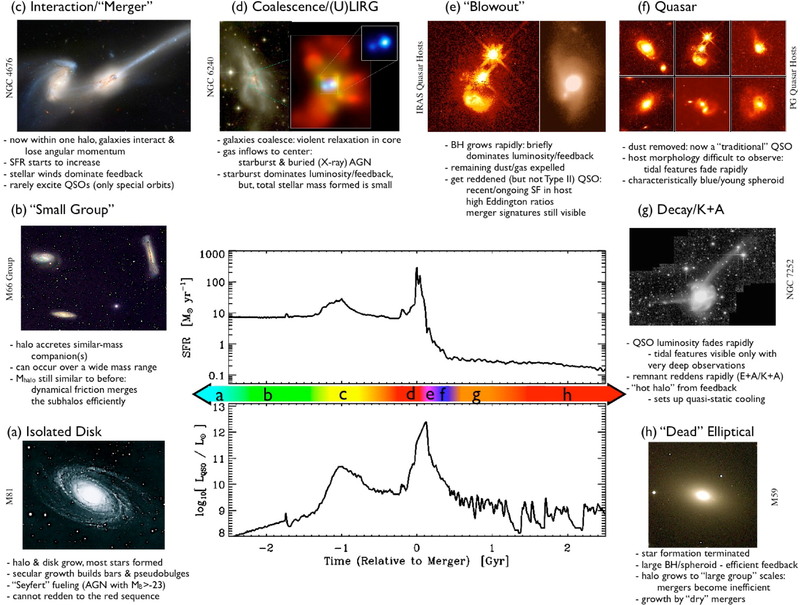 Optically selected hosts showed no excess of mergers when compared to quiescent (non-AGN) galaxies and only showed about merger signatures in about 30% of the quasars (Dunlop et al. 2003, Guyon et al. 2006). At redshifts below 1 they did see an increase in elliptical host galaxy with luminosity, though. X-ray selected quasars also show no excess in merger fraction when compared to quiescent galaxies either at low or high redshift (Cisternas et al. 2011, Kocevski et al. 2012). At high redshift and high luminosity their host galaxies are disks rather than ellipticals (Schawinski et al. 2012). Our work however has shown that red or infrared selected quasars, DO show a high incidence of mergers (or their signatures) up to moderate redshifts (Canalizo & Stockton 2001, Urrutia et al. 2008). Also, low surface brightness features that could be indicative of past mergers were found in many luminous quasars (Bennert et al. 2008), however, these could also be mergers with satellite galaxies, so not as wild and destructive as expected. With that in mind, I would like to present Carolin Villforth’s recent paper: “Morphologies of z~0.7 AGN Host Galaxies in CANDELS: No trend of merger incidence with AGN luminosity” posted on astro-ph recently (1401.5477). She takes X-ray selected AGN and not only investigates the merger fraction, but also tries to see if it increases with luminosity when compared to a control sample. For that she uses the very deep data of the CANDELS survey using Hubble’s new camera in the infrared. By the way, if you are interested in CANDELS, its blog is really great and you can learn a lot from it. Rather than simple visual classification, she used the quantifiable asymmetry index as a tracer for mergers as you can see in the picture. She found no higher incidence of mergers when compared to ellipticals and also didn’t find any increase of merger fraction with luminosity, which leaves us a bit head-scratching, but science isn’t always neat and easily explained. I sat down with Carolin and talked with her about her paper and speculated a bit on her research. Download or take a listen below! Note: This post was written at a later date, but I thought it fitting to add it at the actual date it happened. When I was 6 years old we were driving back from the beach on a warm Sunday night in January. My parents sat in the front, while my grandmother sat with me in the back. Suddenly she leaned over and said “look! Orion!”. I had no idea what Orion was or how it looked, so she took the time to explain it to me. “It’s really quite easy once you see the three stars – that’s the belt and the bright 4 stars around it, well, that’s the frame.” I remember intently staring at it through the car window on that warm winter night. Seeing my fascination, my grandmother suggested the following: “I see you are enjoying watching the sky. Tell you what, when you look up – try to find Orion. When you do, you could think of me, I will do the same!” You see, she didn’t live near me, she was far away in Germany, I saw her once maybe every 2 years. I intently nodded. This seemed like such a cool thing, like it brought me closer, because we shared the same sky. Over the next years she would ask me if I still looked at Orion. Not often, maybe once every 5 years or so and not lately. I always answered in the positive and that was enough for her. Little did she know that Orion became the support, the stake for my further study of the sky. I always had a long vacation in the winter so it was from Orion that I expanded out discovering the sky – upwards (westwards) towards the triangle and that smudge (Taurus and the Pleiades), downwards towards that bright star (Sirius in Canis Major) and the two bright stars that followed (Castor and Pollux in Gemini), left towards that round grouping on stars (Auriga) and that strange W (Cassiopeia). When I got my first telescope, Orion’s nebula was the first thing I tried to see. When I started observing with a CCD camera in the back of a telescope and processing images with IRAF, Orion’s nebula and the trapezium was also the first thing I recorded. Sadly, I can’t seem to find the fits file or the image I made of it anymore. Anyway, even my internet moniker, “bellatrix” derived from the fact that I looked at Orion first for everything astronomical. It was almost a sort of crux when looking at the sky – Orion, then the rest. And often, I thought of my grandmother. Yesterday, when walking home, I showed my daughter Orion. The belt, Betelgeuse, Rigel, Bellatrix, the nebula. Of course, she was more interested in Jupiter nearby, but she acknowledged my enthusiasm. And I thought of my grandmother again. She died very early this morning. I don’t know if we will still be sharing the same sky, but I will keep on staring at it, thinking of her and the love of astronomy she unwittingly instilled in me and kept on fostering in me. I miss her so much already!